And here's a new Verbatim and a lightly edited versions of A lecture by Shunryu Suzuki [no longer on site which carries only one Suzuki lecture at a time] given on Tuesday, March 9, 1971 at the City Center in San Francisco which was used by Ed Brown as a source for a chapter of the new book of Suzuki lectures called Not Always So. 5/05/03- A letter from Mitsu Suzuki, Shunryu's widow, to DC. See the Mitsu Suzuki Main Page. 05/04/03 02:01:00 - Greetings on this numerically interesting second. 5/02/03 - Thanks to Taigen Dan Leighton for the new links for the Current Events Page. Some new links on the Current Events Page and a brief correspondence between a Cambridge prof and DC. 4/13/02 - Excerpts from Tomato Blessings and Radish Teachings: Recipes and Reflections. 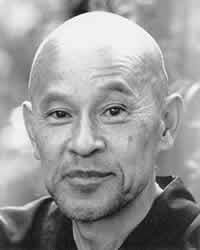 Stories of Ed Brown's life and practice at Tassajara and with his teacher, Shunryu Suzuki. 4/12/03 - Two obscure and interesting errata in Thank You and OK! pointed out by alert readers. 4/10/03 - Bishop Joey comments on the article mentioned below (4/05/03) on the Saint Stupid's Day Parade which he founded. Also, the Iraq civilian body count update is now at the top of the Iraq/911 page which has some new links on it. 4/08/03 - The March 2003 article in the New York Times Magazine on the Tassajara Bread Book, published in 1970 and revised in 1995. Also see the page on books by Ed Brown. 4/05/03 - A report on the Saint Stupid's Day Parade in San Francisco which has taken place every April Fool's Day for about 25 years. 4/2/03 - A reader questions the usefulness of the bodycount. See Readers Comments under the Current Events Page with a reply from DC modified later in the day. 4/1/03 - As you can see from up top, there's a new Current Events Page. Also, please go to this link to find the true meaning of life. Bad links on prior posting fixed. Thanks to Andrew Main for the heads up. 3/29/03 - Some new comments on Shoes Outside the Door and the NYRB review. Go to the Shoes Page and look for - NEW 3/29/03 in a few places. 3/23/03 - Interview with Charles MacDermed. 3/16/03 - Verbatim and lightly edited versions of A lecture by Shunryu Suzuki [no longer active - new lecture on now - only one at a time] given on Sunday, January 4, 1970 in San Francisco which was used by Ed Brown as a source for a chapter of the new book of Suzuki lectures called Not Always So. 3/10/03 - The next Work-in-Progress of The Institute for Historical Study will be held on Sunday, March 16th, at 2:00 PM at the home of Jules Becker, 39 Allen Ave, Ross (415) 453-5587. David Chadwick will present: "Shunryu Suzuki and the San Francisco Zen Center: The Early Years." A personal note from DC on selling the house and jumping into more of the unknown. Read a comment on war and peace from an old friend. 3/03/03 - Had to use that date. 2/09/03 -Program notes for the CD to benefit the late Kobun Chino's children. Just because it's my birthday please don't make anything of it. It's really not important. Any little thing will do. Send check or money order to Birthday Boy, 266 West St., Sebastopol, CA 95472. [New address - David Chadwick, PO Box 2543, Sebastopol CA 95473. Incidentally, for those who this means something to, I'm preparing my house now for sale as the first step in a new era of cuke.com and Cucumber Project downsizing and fiscal responsibility. 1/28/03 - A letter from Stuart Lachs. 1/27/03 - Tony Patchell's Zen dreams. 1/25/03 - An article by Carol Gallup on Kobun Chino Roshi, originally published in The Dot, The Quarterly Newspaper of the International Shambhala Mandala. 1/24/02 - A minimally edited version of the verbatim Shunryu Suzuki lecture put up a few days ago. [not on site now - only one lecture at a time] Much more readable - see Reader's Comments. 1/20/03 - CD to benefit the late Kobun Chino's children. 1/17/03 - Margot Patterson Doss, SF Chronicle writer on walks in the Bay Area and advisor to Shunryu Suzuki, dies at 82. Obituary from the Chronicle (includes photo). Interview by DC. 1/16/03 - a question from a reader in Thailand on work and practice at Zen Center and then his observations on the practice in Thailand and Burma. Brian Victoria - "Behind the Facade of Holy War" and a little Zen Judaism humor. 1/13/03 - An article from the NY Times on Brian Victoria and his important work exposing the role of Zen in promoting militarism, mainly during the first half of the last century. 1/8/03Here's Stuart Lachs' reply to some of my comments of 12/21/02 which you can see the link to below. Also there are a few new comments from me in reply to his reply. To see what this is all about, go to the Shoes Page and check out Stuart's article on the Myth of the Zen Master. 01/02/03 04:05:06 - Just saying hi at 4:56 on January 2nd - at this numerically curious time. 1/1/03 - Happy New Year!